Usually a high scoring game, this looked like the perfect opportunity for Danciulescu to climb into the third spot in the all time best scorers list, but the veteran wasted several good chances. With Torje, Alexe and Ganea looking set to feature as regular starters, we can expect decent results from the team, especially in the summer, when the Red Dogs should be able to sell at least one or two of them for some hefty transfer fees. Disappointing in the first half, the game opposed two coaches who tried to surprise each other with the defensive setup. Pustai used the 2.03 m left back Zarko Markovic as an anchorman, to try and control Lukas Magera, while Dusan Uhrin Jr. responded with the centre-back Cisovsky as a box-to-box midfielder. Horrible decisions, no wonder the match took off only after the break, when Timisoara used its most creative players to kill the game. The home team has invested in some good players this winter, like Abrudan or Adrian Cristea, but they still need time to gel, and a well organized and hard working FC Brasov punished them easily, taking a vital point for their survival. There was a good home crowd, in spite of a protest that asked the fans to boycot the match, as an attack to the club’s owner Adrian Mititelu, a sign that Craiova still has the backing of the fans, which will definitely help in the future home games. Steaua showed no significant improvement after the winter break, with the same obvious lack of creativity, while in Universitatea’s team shone another promising youngster, Marius Ologu, while the star, Florin Costea, wasted very big chances and his team’s chance to get at least one point. Not 100% fit, Wesley proved once again that he’s from a different class, proving decisive in the second half with two excellent goals. Unable to sign any new players until the summer, FC Vaslui can consider the Brazilian’s contract extension as the best winter deal they could have done. Chances at both ends, but Gloria lacks now Junior Moraes, the Brazilian sold for 1.2 million Euros to Metalurg Donetsk, which could do a lot of harm in the standings, this year. Astra could also do with a quality striker – their best scorer, Fatai, is out injured -, but this is one of the most hard working and disciplined team in the league, which should be enough to stay away from the danger zone and also earn some surprising results in the near future. …and we’re off! We’re strating with a game decided even before it took place, but we’re off! It has been an interesting winter in Romania, with some important moves on the market. Steaua and CFR Cluj cashed-in big time on their most promising players, Bogdan Stancu and Lacina Traore, with another very good forward by Liga I standards, Ribeiro Moraes, leaving Gloria Bistrita and the country. Even though we haven’t seen any outstanding signings, this should be a very interesting second half of season, with the first division perfectly divided in two categories: title contenders (yes, CFR Cluj, currently in 8th place, still hope to win the league!) and relegation candidates. We have no mid-table teams, a category that should be defined during next month, when we’ll see who had either their hopes or fears killed in the first couple of matches. Can Otelul hold on and detonate another bomb, just like Unirea Urziceni did two years ago? Undefeated in 18 matches, The Viola will start losing games, as Dusan Uhrin Jr., who returns as a coach, for the fans’ delight, has been asked to take a different approach – try to go for wins and push for a league title that’s in reach. As usual, Timisoara signed a lot of players, releasing the always over-rated Hristu Chiacu and loaning to Urziceni Ioan Mera, a centre-back that would have had little chances to feature, considering the competition. The experienced Sorin Ghionea was signed on a free transfer, with Nikola Ignijatevic coming from Red Star Belgrade to cover for Sepsi’s imminent departure. Tosaint Ricketts is expected to add pace upfront, something badly missed after Timisoara sold Gigel Bucur to Kuban Krasnodar more than a year ago. This is a solid team all over the pitch and a real title contender, although they miss the players and the coach who can cope with a level of pressure that will increase with every round. Looking at the club’s activity on the market, you might get the wrong idea. The club released Burdujan (forward), Pancu (attacking midfielder), Hugo Luz (left back), Haisan (goalkeeper) and punished severely the Brazilian Gerlem (left midfielder), all of them useful players, who could have helped at least as reliable backup solutions, and couldn’t sign a single name, given the transfer ban that will expire only in June 2011. Still, the old dog Viorel Hizo should be satisfied both in terms of quantity and quality, while these departures could make those who stayed and are a bit more confident about their places in the team to act more responsible and focus on delivering what would be an outstanding and, given the recent investment, a deserved achievement for Porumboiu’s club. In some games, they have played excellent football, looking very strong especially at home, where they simply lay siege on the visiting teams and eventually break them, with the support of one of the hottest crowds in the league. Unfortunately for them, the away form remains a problem at Rapid, no matter the quality of the team or the name of the coach, it has to be down to mentality. I was surprised to see that the club didn’t adress the squad’s biggest problem: adding another quality striker, as the Brazilian Cassio delivers only at home and the talented Sburlea’s too inconsistent and yet to turn into a poacher. They’ve released a few players – Cesinha could have turned some games around! – and signed three players that should add even more strength and quality in defense (the Bugarian international Vidanov) and midfield (the Brazilian Olberdam and the fans’ favorite player, Daniel Pancu). They’re very strong, but the 10 points gap demands from Rapid exactly what they’ve missed in the first half of season: consistency. 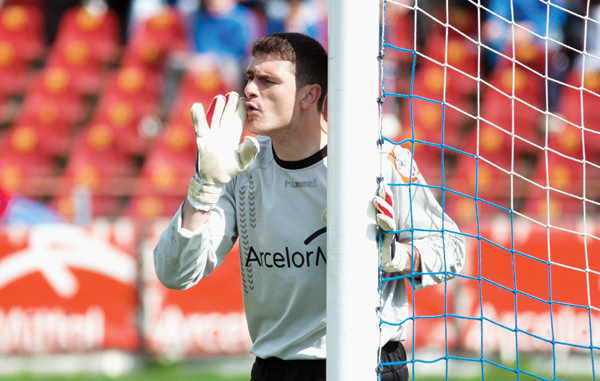 Advice for CFR Cluj: don’t expect a lot of saved shots, if you’re trying to save money! 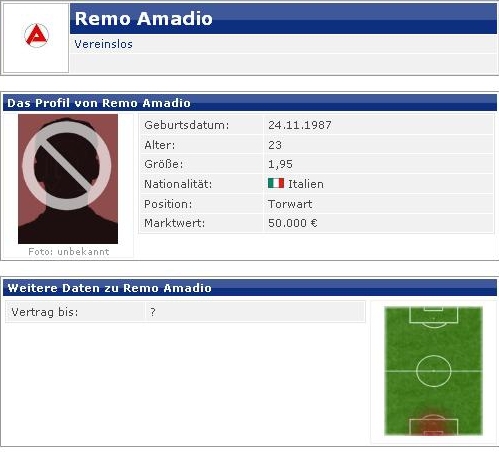 The unknown Amadio gets a chance to make a name for himself in Cluj and also have a picture on transfermarkt.de! Last weekend, we’ve reached the halfway mark in Liga I, but, with a schedule that makes absolutely no sense to me – two more rounds will be played before the winter break – it’s time to take a quick look back at the 17 rounds gone. With Otelul Galati ahead of everyone else, you can imagine that things didn’t really go as planned for the usual title contenders. The Bucharest clubs failed to do better than in the past couple of years and they’re quite a long way back, with Steaua, the only Romanian club still involved in an European competition, sitting in 7th place! Reigning champions CFR Cluj are even in a worse position and, with so many clubs eager to do better in the second half, it’s hard to see them fighting for more than a place in Europe. Although both made the same call as CFR and changed the coaches that had prepared and started this season, FC Timisoara and FC Vaslui have definitely been more inspired and successful. Timisoara remained the only undefeated club in the league, while Vaslui suffered only one defeat in the last 11 rounds (against Timisoara! ), winning eight times thanks to the team’s offensive quality and a bigger dose of luck than the rest of the pack. Basically, Otelul‘s excellent run and Gaz Metan‘s fifth place repay the clubs that had a long term project, were satisfied with a slow, but steady growth in recent years and faith in their coaches, even when things weren’t looking bright, showing that it’s not all about the money spent on an over-priced Romanian market, the foreign players offered for free and the buys from abroad based on highlights presented on DVD, usually by the respective players’ agents! The reunited “mad bunch” from Sportul Studentesc failed to deliver more than a few entertaining matches and the bottom placed club wil probably go down mainly because the owner is satisfied to see good individual performances from the players he is hoping to sell. Unlike the rest of the struggling teams, Sportul’s players will never be desperate to get a result, an attitude easy to find in clubs like Victoria Branesti or FCM Targu Mures. If Victoria keep faith in the young coach that won promotion last year, Ilie Stan, who doesn’t look at all out of his depth in Liga I!, Targu Mures and Pandurii are in good hands, after a poor start. In fact, Targu Mures could struggle to start 2011 with Ioan Ovidiu Sabau still in charge, as he’s considered one of the best choices by CFR’s board, as the champions are looking for the right guy to take over the team, during the winter break. As expected, FC Brasov and Unirea Urziceni, who had suffered massive losses in terms of quality players, are down there, but they’ll put up a fight until the very end, even if top players like Chipciu (Brasov) or Maftei (Unirea) are likely to leave, as well. As you can see, we have no mid-table clubs, with CFR secretly dreaming of a spectacular come-back in the title race and Universitatea Craiova, who, right after Piturca’s appointment, dared even to speak of the title!, only three points away from the danger zone. With everyone still very much in it, it’s impossible to predict what is going to happen in 2011, but here’s what I think it’s pretty vital to change and what’s important to stay the same at the clubs fighting to win the league. Do: sell the players in demand! Rapa’s market price has rocketed and will only go down from there. The title isn’t a realistic goal for Otelul and a place in Europe could be achieved without one or two of the current regular starters. Plus, Marius Stan can buy a whole new team with a million Euros! Don’t: dare to think of the title. The other clubs have the money and means to make sure this won’t happen! Do: make a call regarding the coach, as Contra should either hang up his boots and focus on the new job or leave it to someone else. It’s been going well until now, but enthusiasm and good fortune don’t last forever. Don’t: keep on playing Wesley as a central midfielder and keep on using Burdujan as a winger. Don’t: act like amateurs; allow Rui Duarte or anyone else to skip training and leave the country without severe punishment; act like amateurs! Don’t: further unsettle Eric de Oliveira, you’re going to lose him anyway! Do: sell Torje, Adrian Cristea, Alexe – they’ll bring a lot of cash; get rid of Niculae, N’Doye, Scarlatache, Bordeanu, Moti – they’ll save you a lot of money and spare further embarassment; respect Danciulescu. Don’t: keep on using the old methods! You’re doing serious damage to this league and will continue to play in front of just a few hundred fans!